"N Scale Building's come PRE ASSEMBLED- PRE BUILT for you already, FAST One night finish for the layout !!" they come Pre Assembled, Pre Detailed for you too, ready to add your own color scheme ! 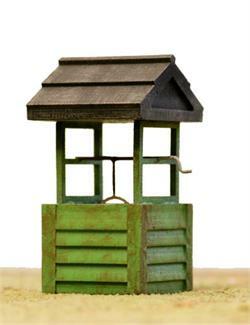 N Scale Detail Water Well....Timeless scale detailing....this comes in Pre Cast and Pre cut sections to make it fast and fun for you to add this to your scenes.........really neat scene detail !